Welcome to our collection of stainless steel taps - the flagship tap ranges for the home opting for the most modern metal finish of all - beautifully brushed and polished stainless steel. Each of the taps within our collections are finished to 304 and 316 grades and with items that include Basin taps, bath taps, freestanding bath taps, bath taps with handheld shower attachments, wall mounted and deck mounted there is literally a solution to every style preference, with products that are both designed and built to last a lifetime. We like to think that at Living House, we lead the way with products that create a visual impact within any home into which they are placed. And there may be no better a beautifully vivid demonstration of this than our Flower Stainless Steel Collection. The brilliantly bright lacquer of this collection is coupled with a brushed stainless steel finish for ultimate contrast. They may be teamed with a fresh palette of white walls, or worked into a colour scheme which is just as bright as is seen amongst your tap head colour choices. What's more with a design that sits balanced between the decidedly industrial and the understated contemporary, these statement pieces are a wonderfully pliable product line. The Slimm Stainless Steel Collection can be said to be one of our most understated collections, bringing a beautiful artistry to the tap form. Products here include the wonderfully effective wall mounted basic tap, to the seemingly impossibly slight Slimm Rain Shower (which, despite its elegance, packs in a luxurious punch of power for a spa like shower experience). Elegant lines, yet a design that is defined by contemporary style. The Noa stainless steel tap collection mixes the gentle, subtle curves that are more commonly associated with traditional style, and mixes it into a collection with a fresh, modern touch. Truly irresistible for period homes that seek out sympathetic bathroom fixtures that may be perfectly placed even alongside the features that so attracted you to a period home. Equally however the items within this collection can be just as complementary to the modern bathroom, where expectations are of the highest and most demanding standards. Now finish off your designer bathroom with the superior quality accessory collection. Our stainless steel bathroom accessory collection has been carefully put together, with products that each have been handpicked, to complement any and all of the designs and styles within the ranges you see before you. Here you will find items that are crafted to the highest of standards, where shower and bathroom accessories make any shower a luxurious, spa like scene and experience; and including shower baskets, soap dishes, toothbrush holders and much, much more. A beautifully highly contemporary bathroom tap collection finished and brushed stainless steel. These stainless steel taps range offers all the fittings required to produce a stunning minimalist bathroom design. We offer basin and bath taps for basin and wall mounting, bath taps with handheld shower attachment, plus to compliment rain and waterfall stainless steel shower heads & thermostatic shower valves. The Noa stainless steel tap collection has a brushed finish & made in Italy in a modern styling. We offer all the taps & shower fittings required to style a stainless steel themed bathroom. Included are basin taps in single lever & mixer designs for wall and deck mounting, matching bath taps & freestanding bath fillers plus shower heads & thermostatic shower valves. 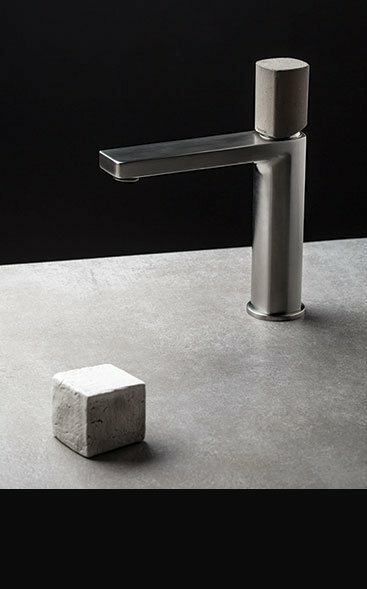 The concrete tap collection is the latest in Italian styling and is highly unique with its concrete handles. These contemporary styled taps were initially designed to be made in brushed stainless steel but we are now offering this exclusive collection in polished chrome. Within this luxury bathroom tap range we offer the full range, including basin taps, bath fillers in freestanding and wall mounted designs plus matching shower heads and shower mixer valves to compliment. These stainless steel taps are the latest in Italian styling and unique in its use of brushed stainless steel and colours. Each bathroom tap has a stainless body with coloured wheel handles styled on an old water hydrant design. These coloured handles are available in the colours of white, red, black, green, blue, yellow & pink. These designer taps give a unique and exclusive design theme to luxury bathrooms. Within this range are basin fillers, bath taps in freestanding, wall and deck mounted designs, plus shower heads and shower valves.